The time as come for back to school. We were all digging in our heels and trying to make summer break last as long as possible, but we are into our last few days before the first day of school. We had meet and greet at our school yesterday where the kids got to meet their new teachers and see their new classrooms. We're thrilled with their teachers and after meeting them all three of my kids said they couldn't wait for school to start on Monday! I just know they are going to have a great year. I've shared this idea several times before, but I always like to make little gift baskets to take to the teachers on this day. It helps let them know just how excited the kids are to be in their class and really sets the tone for how much we appreciate them all year long! What we put in the baskets will vary from year to year and since we've been so busy recently, this year I made it easy on myself. I got some great gift basket supplies from Oriental Trading. 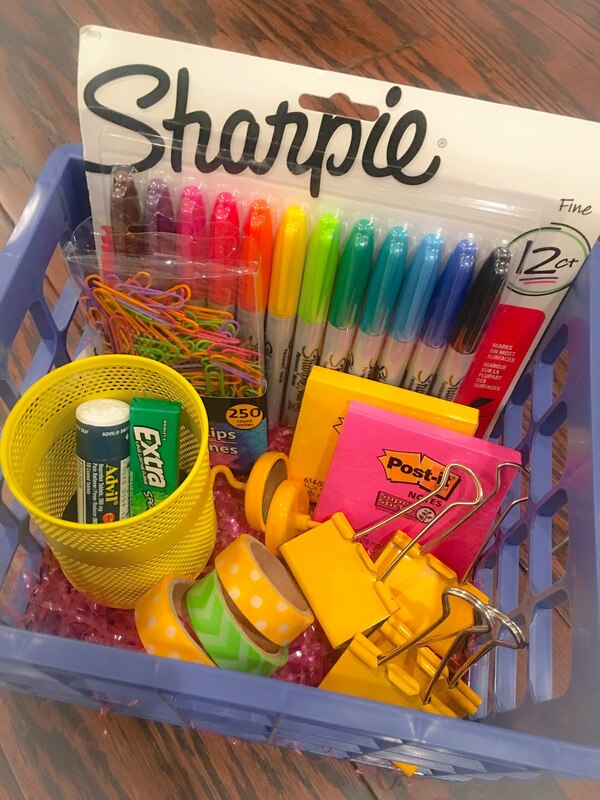 They have a huge selection of items for teachers and classroom supplies. 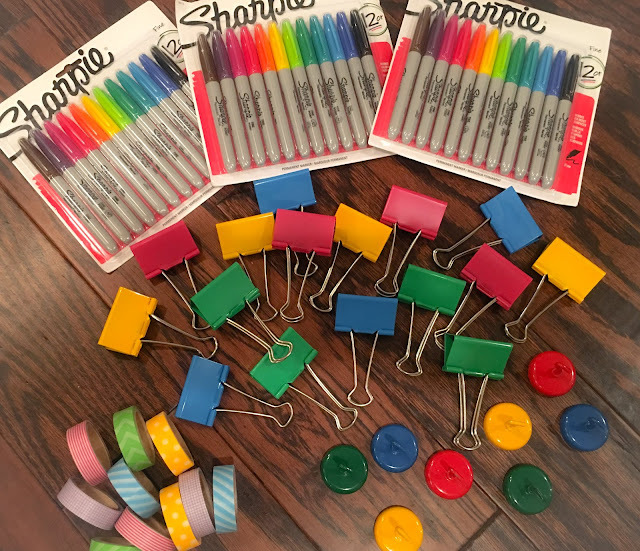 I went with Sharpies, large colorful binder clips, magnetic hooks and fun washi tape. I always pick up baskets for this project at the Dollar Store and while I was there I grabbed a few other items to help fill the baskets. Pain relief for those days that noisy children might give them headaches, gum, notepads, and other little goodies. 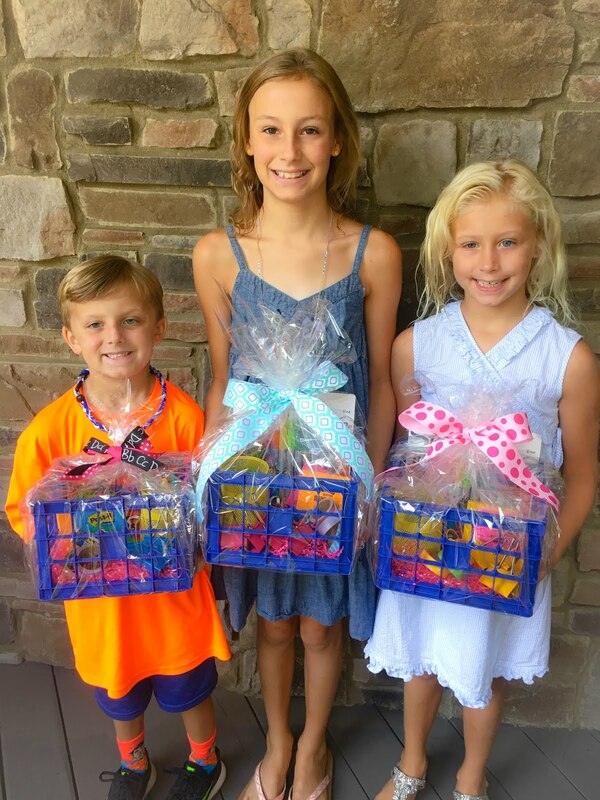 We arrange everything in a basket, wrap it up with clear cellophane and tie it with a pretty bow! The kids love helping to put these baskets together for their teachers and they are always even more excited to give it to them. 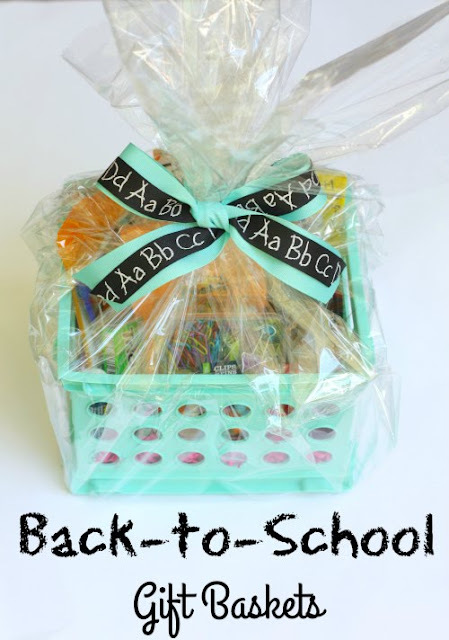 I feel like this is a great ice breaker for kids that might be a little nervous or timid to meet their teachers because it gives them a purpose and makes them excited to walk into their room and present the gift to their teachers. It's always a pleasant surprise for the teachers and puts a smile on their faces. They love being shown how much we appreciate them from day one.